Extra Butter's Jason Faustino says a late-night craving for Halal Cart chicken and lamb over rice inspired the supple sneaker. 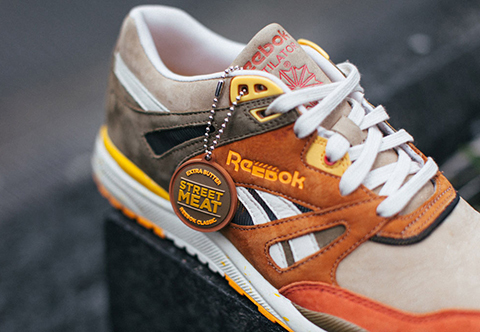 New Yorkers love their halal food—a fact that inspired sneaker boutique Extra Butter to create the Reebok Ventilator ‘Street Meat’ Edition. Reebok asked Extra Butter to put its take on the Ventilator to celebrate the shoe’s 25th anniversary. Extra Butter owner Jason Faustino was trying to think of a design, when he suddenly had a late-night craving for Halal Cart chicken and lamb over rice. The rest is sneakerhead history. 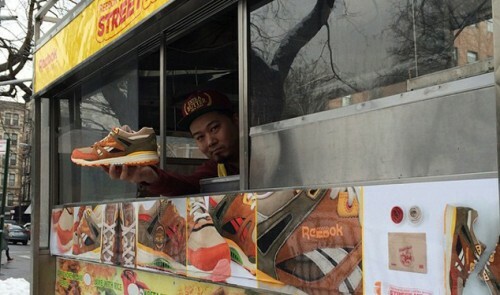 Ahead of the shoe’s official launch at Extra Butter’s brick and mortar, the team rolled around the city in a halal cart that ditched the usual tasty imagery across the cart’s sides for images of the supple shoe. The ‘Street Meat’ shoe is now available on Extra Butter’s online shop, as well as in-store at Extra Butter’s Lower East Side and Rockeville Center locations. We spoke with Faustino about the Reebok Ventilator ‘Street Meat,’ his love of halal, and where he likes to go for lunch in the LES. 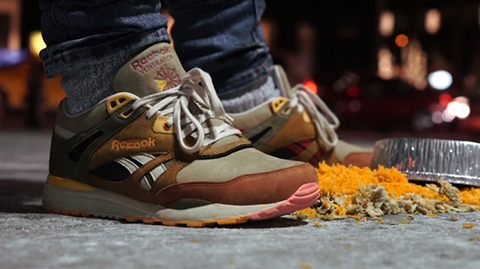 Why do an homage to halal food in sneaker form? When we got the assignment from Reebok, they told us we would be telling the anniversary story of the Ventilator, which came out in 1990. Typically, Extra Butter looks to movies for design inspiration, but we had too many choices for films that came out in 1990. Figuring out these types of things tends to keep me up late at night; I had a craving for halal that night, and one thing lead to another. Aside from that, street food culture in New York began in 1990, and I figured it was a really different way of telling a New York story. Since Extra Butter’s arrival in the LES one year ago, I’ve been wanting to do a project that celebrates a part of New York, but doesn’t do it in a typical fashion. I thought it would be cool to do something that hits home for us and the people coming through the shop. Halal carts are a really New York thing, and everyones had street food before, so we wanted to champion that. Do you have a favorite street meat stand that you were inspired by? Previously, I would have said the guy on Essex and Delancey, who really made me like halal more than the original Halal Guys (those guys are awesome, too). The people we had cater [the sneaker release party], Madina, were really awesome—their white sauce is a little sweeter and tangier and their rice is a little spicier. Are there future Extra Butter food-influenced sneakers in the works? Like, a shoe based on buttered popcorn? If End Clothing didnt do something so great already with their burger sneaker, i would have ended up going that route. But a food-influenced design is bound to happen again, because we talk about food so much, and we keep getting excited about food designs. Everyone should check out our Instagram lunch specials, where we take a shoe that we’re selling and do a flash sale of the day, and we pair the shoe with something we were eating for lunch. Is this collab with Reebok a one-time thing? We did something with them three or four years ago: Robin Hood: Men in Tights-inspired Reebok Pumps. They were inspired by the iconic scene in the movie where Dave Chappell pumps up his Reeboks before getting into a fight. We did two shoes with Reebok based off of Chappell’s character in the movie, AHCHOO. I heard you tried to get The Halal Guys on board for the collab, but they declined. Any idea why? They had trouble getting the concept, and they didn’t know if the sneaker and the nick name “street meat” put their brand in a bad light. What I don’t think The Halal Guys realize is that New Yorkers embrace street meet as something true to the city. The Halal Guys would have prefferred something that didn’t make their brand look street—but we were like, you guys are street carts, you are street. We figured we’d just go for Madina, which turned out really well. What’s your go-to street meat order? Combo lamb and chicken over rice. Where do you go for lunch around the Extra Butter LES shop? 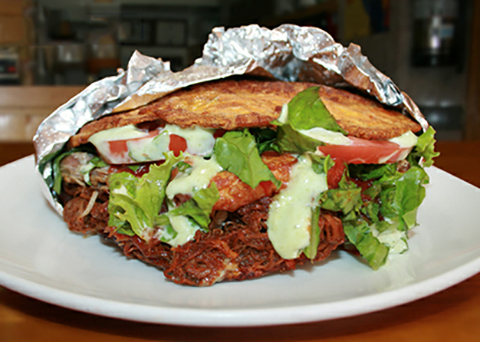 Patacon Pisao just opened on Essex; they serve Venezuelan sandwiches and the bread is made from smashed green plantains. Also get the cachapas when you go there, which is like sweet corn pancakes stuffed with meat and cheese. I love Ivan Ramen; my regular order there is dry dan dan noodles. I love Sweet Chick, and I really like Pala on Allen—it’s an Italian restaurant, and they have a regular menu and a vegan menu. And then there’s The Meatball Shop, where I usually get the meatball smash with chicken and parmesan cream sauce. I’m also a huge fan of their specials.